With an arched headboard and a lovely distressed finish, this queen sized bed will be a perfect centerpiece in your bedroom. 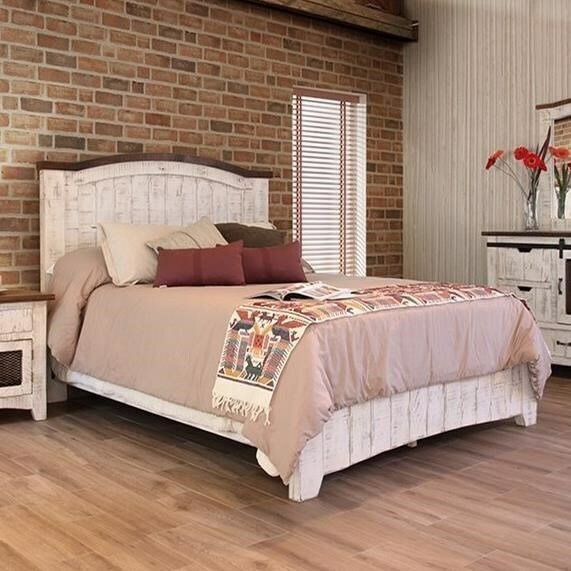 The low-profile bed has a planked design on the headboard and footboard adding to the rustic design. Pair with the matching storage furniture from this collection for an updated and stylish bedroom. The Pueblo Panel California King Bed with Plank Design by International Furniture Direct at Furniture Mart Colorado in the Denver, Northern Colorado, Fort Morgan, Sterling, CO area. Product availability may vary. Contact us for the most current availability on this product. IFD360PLTFRM-CK 6/0 Low Profile Footboard & Rails 1 82" 2.25" 14.5"
IFD360HDBD-EK 6/6 Headboard 1 83.75" 3.25" 59"